Remember way back in the Fall when I painted my family room blue? The room is still at a total standstill and it’s driving me crazy. So I enlisted the help of two of my favorite women, Deb & Erin, from Fresh Nest Design. I sent over photos of the space, what I hoped to accomplish with it, what kind of style I envisioned, and VOILA! just like magic I have a new design for my family room. All I have to do now is incorporate the style. If you want to submit your own redesign, go here. Thanks Fresh Nest, I can’t wait to show you the *after* photos! Design Instructions: Move the mirror thats above the fireplace to above the sofa. This will help make the width feel larger than the 10?10? that it currently is. Move the clock youve got on the floor, and hang it above the fireplace instead. Youve done a great job accessorizing the fireplace, the only thing I would add is to put the globe on the left side near the star. This will help to balance the accessories a little better. 1. Poang Chair from Ikea. This is one of the most comfortable chairs Ive ever sat in and it doesnt take up as much space as a fully upholstered chair. This chair is great for relaxing and reading! Use the Sirkon Sand fabric for a more modern vibe. 2. Storage Ottoman from Ikea. Use this to store games and toys for quick access when needed. This also makes a great surface for playing games on. 3. Make some simple pillows with the Honeycomb Lime and Ripple Stripe Green from Amy Butlers Ohio Sky Collection. Place the pillows on the chairs and sofa to pull the space together and to add a little pattern. 5. Extra storage shelves. These could be used for both games and books. 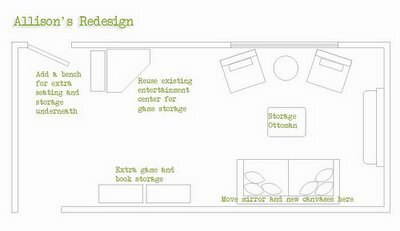 This will make everything in the room easily accessible and in the end will help the space be used more. 6. The mirror above the sofa will seem a little small in scale so buy (or reuse) canvases and paint it one or two coordinating colors. These should be about 10? square. Try using a nice apple green for a splash of color there. Many times you can find old canvas paintings at thrift stores for cheaper than buying a new one. Just paint primer on top of the existing painting and use it as a new, blank canvas! 7. Use your old entertainment center for game storage also. Remove the doors from the bottom. To cover the storage underneath after removing the doors, make a simple fabric panel to the dimensions of the opening and secure it to the top of the opening with velcro. This will add a little accent to the piece AND cover the clutter that sometimes happens in storage spaces! what fun! I think those ideas are great…and you can't go wrong with a Poang. I keep trying to figure out how to incorporate one in my house. Hubby LOVES them. 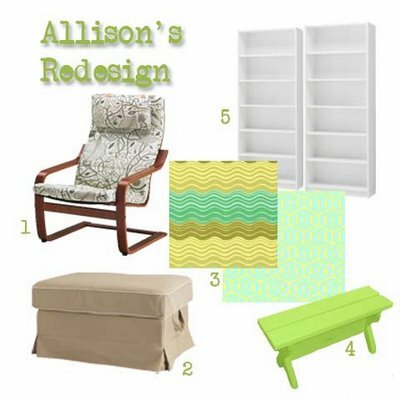 Thanks again Allison for letting us design your space!! I'm SO glad you enjoyed our design! Can't wait to see the finished design! I'm totally diggin' on the color choices for this room – very eclectic and bold! I'm excited to see how it all works together. And let me just second the props for storage ottomans – mine is my very favorite piece of furniture in my home. As a mom of little ones, it's a gentle replacement to a sharp-edged coffee table, works well as additional kiddo seating and makes last-minute cleanups (for surprise MIL visits) a cinch – open it up, jam it full, shut it!